Teremini is the nickname for the simplest type of capacitive sensor that in the past has been given the name “theremin”, originally “termenvox”, by his inventor Lev Sergeyevich Termen. 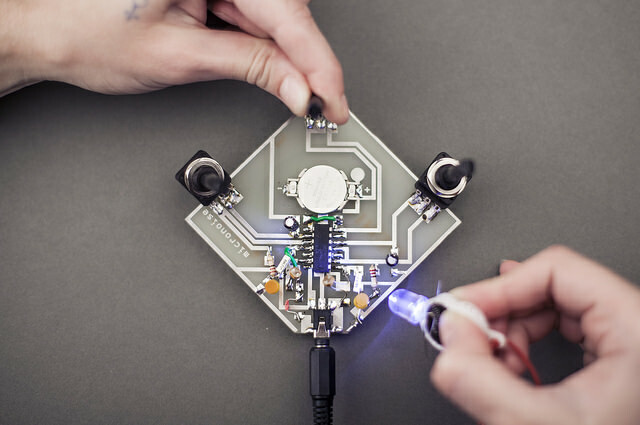 The kit you are holding in your hands is called Theremini 4011 is one of Trivia Records DIY projects and was prepared by Borut Savski in collaboration with Ljudmila Art and Science Laboratory. The invention of theremin goes hand in hand with the pioneering years of radio – electronic amplification – the 1920s. In fact, it is a cast-away of the development in the field of radio – namely: the heterodyne (frequency mixing) principle and the observation of the capacitive properties of human body. With termenvox, this usually undesirable effects were put to good use. Termenvox is in essence a capacitive sensor that functions by comparing the frequencies of two oscillators. One of the oscillators is fixed and the other is coupled with the antenna to its surroundings. A human moving their hand acts as a capacitor to ground and adds themself to the oscillating system. The closer the hand (or any part of the body) – the higher the total capacitance and thus the lower the oscillating frequency. The free-running frequency (no hand near the antenna) of this variable oscillator should ideally be the same as that of the fixed frequency oscillator – making the difference of these two frequencies equal to zero. 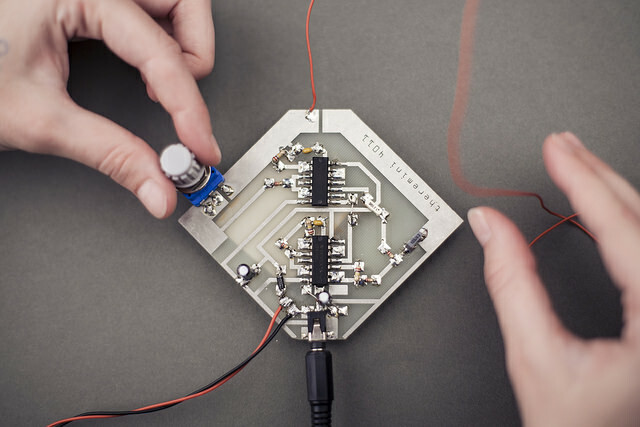 TouchTone is a feedback amplifier system using all six inverters or inverting amplifiers of the CMOS 4049 chip – said in simple words – TouchTone is a simple noise synth to be played directly with your fingers. The board was insipired by Dirty Electronics and was developed by Borut Savski, Luka Frelih and Saša Spačal. TouchTone uses the inverters in combined digital/analog mode. Two pairs are used as variable frequency oscillators, lower and high frequencies, and third pair is used in mixed amplifying, filtering, oscillating feedback mode to play around with the existing pads all over the system. Combining touchable pads in various manners can bring out interesting – very complex results. 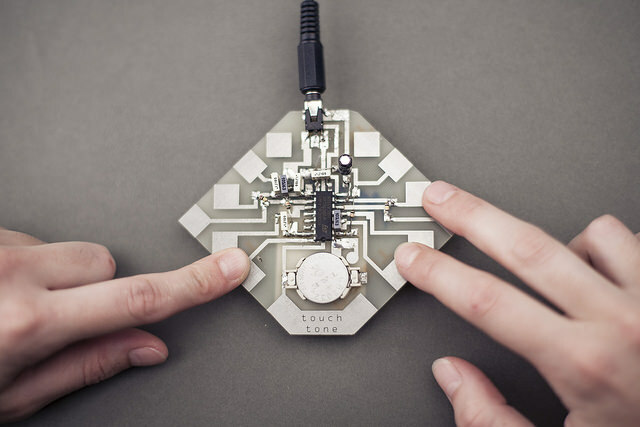 The touch pads also give name to this synthesizer – Touchable Anton or just DotičniTone [TouchTone]. MicroNoise was made as a DIY project by Ljudmila – Art & Science Laboratory and Trivia Records (and related workshops by both co-producers). It was further developed for special needs of Theremidi Orchestra. The circuit was perfected/simplified and brought to our attention by Marc Dusseiller (dusjagr labs). Some were built later in the vicinity of Cirkulacija 2 collective and the positive results made it perfect to develope further. The integrated circuit is fully optimized and used entirely to make a two channel system with some open options for additional hacking. The circuit is built around quadruple 2-input logic gates of the NAND type (not AND; inverted AND). AND logic means that the 1st and the 2nd inputs have to be one to output 1 (1 = true = HIGH). The circuit has simplified oscillator sections due to use of Schmitt triggering of gates. This means that some positive feedback is applied to every gate to make the transitions from one state to another more defined (also refer to hysteresis* action). *Hysteresis is the dependence of a system not only on its current environment but also on its past environment.